The Ford Model A automobile was made from 1928 to 1931. Another model with the same name was built from 1903 to 1904. This model was a big success for the company after the Model T. Over two million models were sold by July, 1929. The body styles ranged from the $500 Tudor to the $1200 Town Car which had a dual cowl. Basic colors of black, grey, and green were available. By March,1930, over three million Model A's had been sold and nine different body styles were available. The Model A was available in a wide range of styles such as the Coupe, Convertible Cabriolet, Fordor, Station Wagon, Taxicab, Truck and Phaeton. The Model A vehicle was the first car by Ford that used standard driver controls which included a conventional clutch, 4-wheel drum brakes, gearshift and throttle. It came with a forty horsepower and a water-cooled L-head 4 cylinder engine. It had a top speed of about 65 mph. 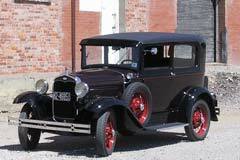 Production ended in March of 1932 for the Model A and it was replaced with Ford's Model B.